We design and install thoughtful, livable outdoor spaces. Bloom Floralscapes employs the best in the industry to elevate your outdoor space to the next level. We are landscape planners with an in-depth knowledge of our local market. We approach every site as a new opportunity to maximize the site and building value. With our solid knowledge of local plant material, hardscape options and best management practices, you can count on us to exceed your expectations for your new design, installation, and maintenance. Every great landscape starts with a plan. Our talented team includes graduates of Colorado State University’s accredited Landscape Architecture and Horticulture programs. We are proactive in identifying our clients’ individual needs and approach each project with long term vision. We strive to incorporate innovative solutions for each project, customizing every design to meet your needs and desires. From annual flowers to outdoor kitchens, we can bring your dream to life. 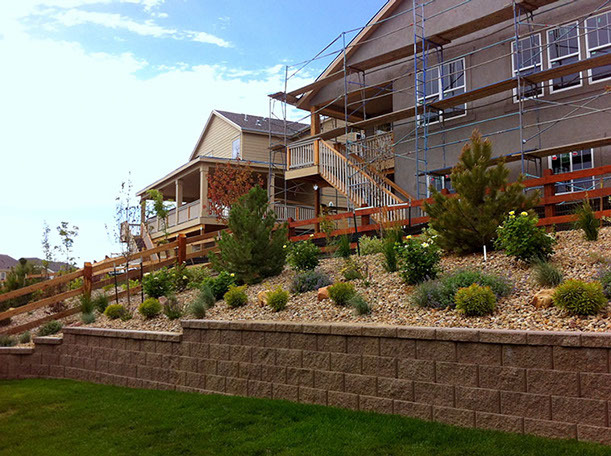 We have extensive experience installing landscapes for both commercial and residential sites. We provide comprehensive landscape maintenance programs that ensure the sustainability of your site. 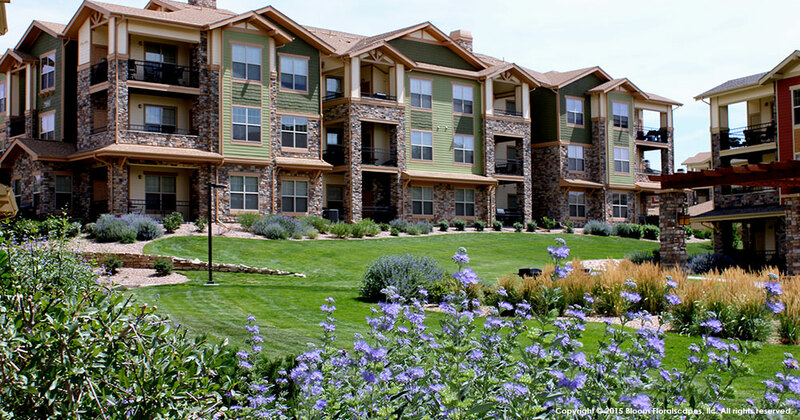 Our talented design team includes graduates of Colorado State University’s accredited Landscape Architecture and Horticulture programs. We are knowledgeable about sustainable design practices. We search for innovative solutions to solve site issues. Xericscaping doesn't mean all rock. By incorporating the seven principles of xericscape gardening into your landscape, we create exciting landscapes that are beautiful, functional, water-wise and will be sustainable for years to come. The seven principles start with a good plan. Through the creation of a plan, we assess how you would like to use your landscape and optimize the best areas for these activities. Hardscape location, such as decks, patios, and walkways, and plant selection are thoughtfully considered. Step 2: soil analysis; soil retains moisture better if properly prepared. Step 3: plant selection. The right plant in the right place is key for sustainable landscaping. We take into consideration plant type, mature size, light requirements and water requirements when selecting plants. While small when planted, a tree planted next to a house or walkway will become a maintenance nightmare in the future. Step 4: turfgrass planning, is a priority for successful xeriscaping. Turfgrass areas provide areas for play, serves as erosion control, and absorbs heat, cooling the surrounding environment. They are imperative for most residential and commercial properties; however, the wrong type, location, shape or area can lead to wasting water. Our goal is to design a turfgrass area that is large enough for all your activities, a shape that allows for efficient irrigation, and is aesthetically pleasing. Step 5: efficient irrigation, is necessary for plant establishment and reducing water waste. To maximize water conservation, irrigate turfgrass with sprinkler systems and plant material with low volume drip irrigation. Step 6: mulching, proves a cover for soil, reducing evaporation and helps to retain moisture for plants. Step 7, maintenance, all landscapes require some maintenance, but by following steps 1-6, we can prevent and/or minimize foreseeable maintenance issues in the future. Our field staff is comprised of highly knowledgeable and industry certified professionals. Bloom led renovation projects are detail focused. Our attention to detail goes beyond the installation. Our planning and logistics efforts allow for timely project completion. Seasonal color is our specialty. We recognize that curb appeal is of the utmost importance. Designs are tailored to meet the preferences of our clientele. We go to great lengths to exceed the expectations of our clients and deliver a personalized experience. Your account manager and designer will work with you to determine preferences while working within your budget. We consider every facet of the entry ways and focal points to deliver award winning displays. Our talented team can provide year-round color programs. Just because summer is over, doesn't mean your pots and flower beds should be empty. We offer fall and spring pansy installation, as well as fall, winter (holiday) and spring decor to keep your curb appeal colorful year around. By utilizing BMPs (Best Management Practices), IPM (Integrated Pest Management) and providing services that incorporate proper horticultural practices, we optimize the overall health and sustainability of the landscape.